The Ojibwe called it gitche gumee, “the great sea.” We just call it the greatest of the Great Lakes. At the edge of the Porcupine Mountains, you’ll find 21 miles of shoreline along the pristine, sparkling waters of Lake Superior. For many visitors, it’s these awe-inspiring waterscapes and unspoiled shores that bring them back to the Porcupine Mountains, season after season, year after year. Spend a sun-soaked afternoon strolling the beaches to find driftwood, agates and more, or end your day with a dazzling sunset and stargazing—if you’re lucky, you may even see the Northern Lights. Bold hikers can also tackle the Lake Superior Trail, one of the longest and most challenging routes in the Porcupine Mountains Wilderness State Park—but one that rewards visitors with spectacular views along the shore. 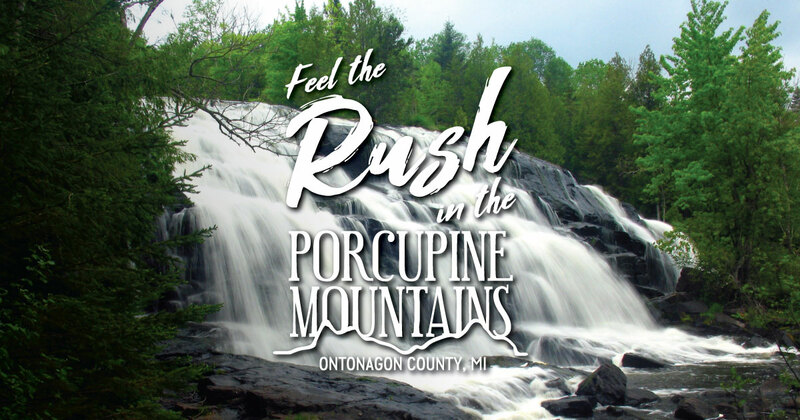 Learn more about hiking the Porcupine Mountains here. Ontonagon Township Park (1 mile east of downtown Ontonagon): Beach access is available from public parking lots as well as campsites. Pets are allowed on leash. Union Bay (2-mile stretch of shoreline featuring campground on western end (part Porcupine Mountains Wilderness State Park); beaches are accessible from several points on M-107. Black River Harbor Recreation Area (15 miles north of Bessemer, Gogebic County): A sandy beach is located near the day-use area; cross the wood suspension bridge to access the lake. When Lake Superior freezes over in early winter, ice volcanoes develop along the leading edge of the forming ice. Waves coming into shore from deeper water rise up as they hit the shallows, causing water to spout up through cracks in the newly formed ice. This wave action creates the characteristic cone shape of the ice volcano. The height of cones can vary from two feet to more than 30 feet. These ice volcano formations remain through the winter. Use caution when approaching ice volcanoes: Watch for thin ice and stay away from areas of open water.